A common makeup mistake is storing your makeup products in the bathroom. Why it’s wrong: It sounds strange, but a lot of our beauty products contain natural oils and waxes in them that fluctuating temperatures in the summertime (or after a hot shower) could ruin. While a lot of products are tested to hold up at room temperatures, the consistencies of some natural products, eye creams, perfumes, nail polish, facial masks, and eyeliners fare much better in cooler conditions. Quick Fix: Move over, milk! 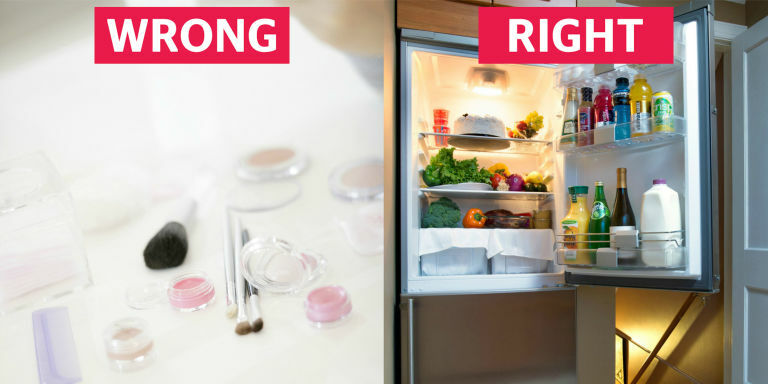 Stick your products containing natural or organic ingredients in the fridge to prolong the shelf life and protect your makeup from being exposed to harmful temperatures. As a makeup enthusiast, shopping for beauty products and tinkering with them afterwards can be one of the most fun things you can do. You also probably have a makeup routine you’re so used to following every single time you glam up. But hey, what if you’ve picked up a habit that is a major no-no in the beauty world? While hearing makeup tips from your friends is always appreciated, there’s nothing more valuable than beauty advice from seasoned makeup pros. Here are some things they wish you’d stop doing. Read on to find out how many you are actually guilty of! An eyelash curler should only be used BEFORE putting on mascara. Mascara makes your eyelashes tacky, and further pinching them between two metal clamps is just asking for trouble, according to MUA Kristina Johnston. Always follow the golden rule: curl first, mascara last. Celebrity makeup artist Beau Nelson firmly believes that you can look however you want to look, but he’s concerned that quite a number of women may be too engrossed with Instagram trends. He said that putting on too much makeup does not look flattering in pictures with professional lighting, let alone full daylight and fluorescent lights. Posted in Makeup Hints and Tips and tagged affordable makeup brushes, beauty, Beauty tips, best makeup brushes, Featherstroke, how to apply makeup, makeup, makeup artists, makeup hints and tips, makeup mistakes, makeup tutorial, too much makeup.